Walk through Pier Park and you find yourself walking under the high canopy of Oregon’s state tree – the Douglas fir. 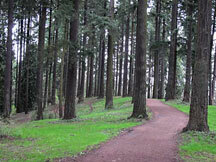 Douglas firs definitely dominate the park’s landscape. Coastal Douglas firs are the 2nd tallest trees in the world (2nd to the Redwood) and can live between 500 – 1000 years old. Douglas firs, named after the famous Scottish botanist, David Douglas, are not true firs. Unlike a true fir its cones grow downward. Seeds from the cones, easily identified by the 3-forked looking bracts, are a favorite food of the park’s squirrels, which eat them like corn on the cob. Watch for squirrel “middens” – piles of cone scales – and chewed cones on your next walk. 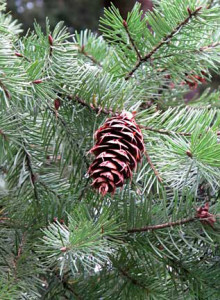 Douglas fir needles are the sole diet of the Red Tree Vole. Coast Douglas fir is one of the world’s best timber producers. Its wood is widely used for dimensional lumber, flooring, railroad ties and plywood. Its sap is a source for glue and photo supplies from its sap. This is the nations most popular Christmas tree. Summer in Pier Park would not be the same without the shade of our Douglas firs.